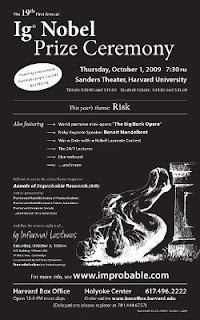 Annals of Improbable Research (AIR), which annually bestows Ig® Nobel Prizes to those in the scientific community “for achievements that first make people LAUGH then make them THINK,” awarded its first Ig® Nobel for literature last night at its gala 19th First Annual Ig® Nobel Awards ceremony at Harvard's Sanders Theater. Our header photo today is from the 2007 ceremony. Ig® Nobel Medicine Prize winner Dan Meyer "punctuates his and Brian Witcombe's joint one-minute-long acceptance speech. Meyer and Dr. Witcombe (who is not visible in this photo, having stepped back to give his colleague breathing room) were honored for studying the medical side-effects of sword-swallowing. Nobel Laureates William Lipscomb, Robert Laughlin and Dudley Herschbach can be seen here analyzing Mr. Meyer's speech." (Photo credit: Alexey Eliseev). While it may seem that Annals of Improbable Research (AIR) lampoons its subjects, nothing could be further from the truth. The seriousness which AIR devotes to the scientific community is typified by its thoughtfulness: It has recently established the Luxuriant Hair Club for Scientists, "a club for scientists who have, or believe they have, luxuriant flowing hair."